From then, Dao An followed Fotudeng 佛圖澄. Every time Fotudeng went out to teach about Buddhism, Dao An would go with him and even need to repeat his lectures. After many years, Dao An started to travel again and went to 冷澤 Leng Ze and then to Hebei河北 province, going to Flying Dragon Mountain飛龍山, Tai Xing Mountain太行山, Xing Mountain恒山. He eventually built a temple, which he called “Standing Tower Temple立塔寺”. After all the travelling he had done, Dao An’s name and reputation had spread out and many people came to study and become his student. He had over 500 hundred students following him. The most special of these was a person called Hui Yuan慧遠. Toward the end of his years Dao An had over thousands students and followers. When Dao An was 45 years old, he returned to Ye Du. In 368 Dao An’s teacher, Fotudeng, passed away. 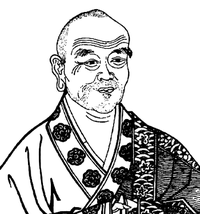 Dao An continued to develop his Buddhist teaching in many areas, though he was still based in Hebei, but also Shanxi Province. This meant that Dao An was twice as important to king, and so a very important person in the Jin Dynasty.